For my most recent birthday, my thoughtful brother and sister-in-law bought me a veggie slicer. Yes, I asked for it! It’s been on my Amazon wish list for ages but I never got around to ordering one for myself, so imagine my surprise when I opened the Amazon box eagerly (who doesn’t love getting a package in the mail?) to find the Paderno World Cuisine Tri-Blade Plastic Spiral Vegetable Slicer nestled inside. Woo! And days after getting it I had to put it to the test by making my first batch of zucchini spaghetti and meatballs. Which turned out to be a piece of cake with this baby. In less than 20 minutes total, dinner was ready. And this version of spaghetti and meatballs is way lower carb than the traditional pasta version, plus gluten-free and paleo friendly depending on what you put in your meatballs and sauce. Below is my first recipe, I hope you enjoy. Prepare meatballs according to package directions. For Aidells this involves heating them in a pot with a couple teaspoons of olive oil. Once meatballs are hot / cooked, add sauce to pot and let marinade while making spaghetti (this part takes no time at all). Wash zucchini and both ends off. 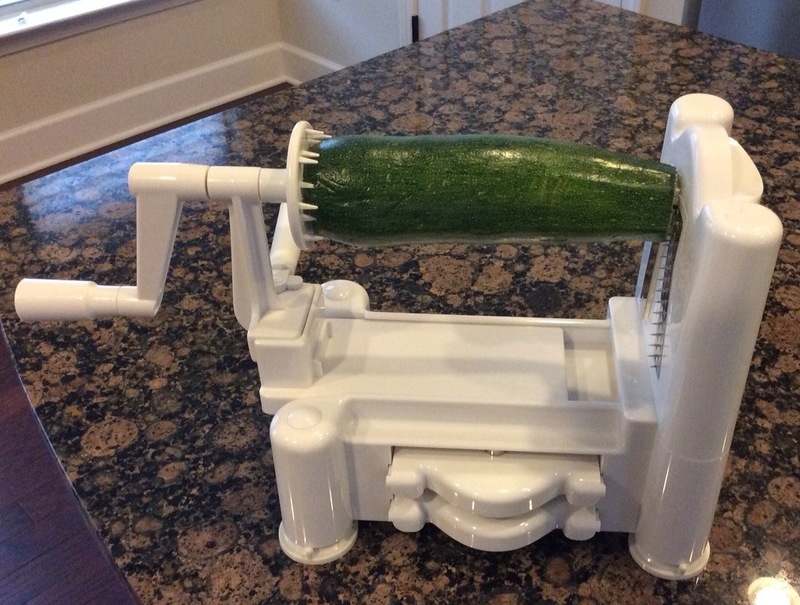 Insert first zucchini onto spiral slicer. 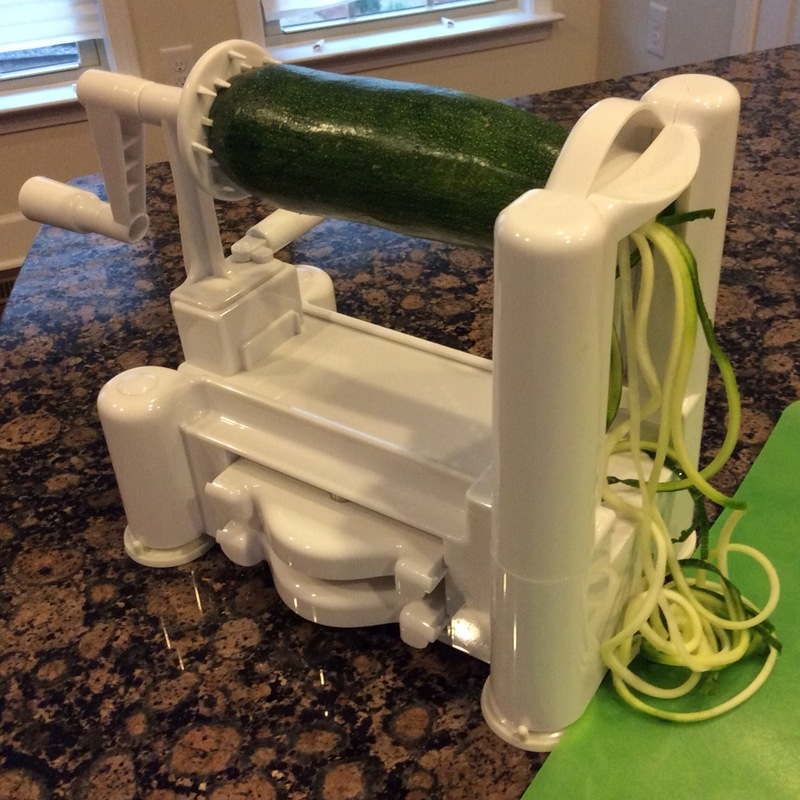 Crank away, periodically trimming zucchini strands as they become spaghetti to avoid ending up with one long strand at the end. 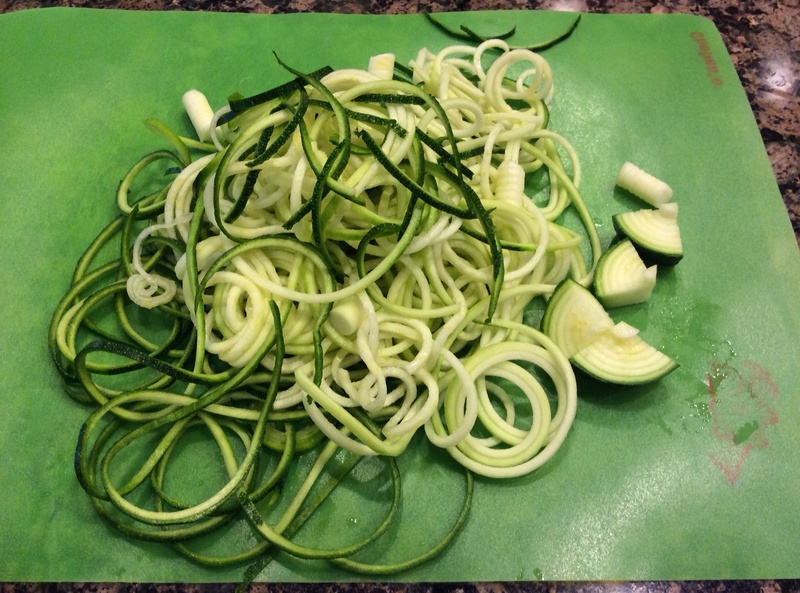 Repeat until all zucchini is not spaghetti. Place ‘spaghetti’ in microwave-safe dish and cover. Microwave for 2 – 3 minutes. Cooking times will vary depending on how much spaghetti is made. Drain any excess water and toss with salt and pepper to taste. Divide up among plates and add hot meatballs and sauce on top. The zucchini pre-slicing. It’s locked and loaded and ready for action. It’s unbelievably simple to turn this zucchini (or any other veggie you can think of) into spaghetti strands with the Paderno. In less than two minutes, a large zucchini was demolished to nothing more than this pile of ribbons. Now, just nuke it (or stir-fry, whichever you prefer), top with sauce and you’re ready. This entry was posted in Entrees, Paleo, Recipes and tagged Entrees, Meatballs, Paleo, Recipes, Spaghetti, Zucchini on March 24, 2014 by Paige N..